shooey - Aldi has cheap thermal wear, long johns etc on sale tomorrow. I had a dream come true today. After a couple of years of searching l eventually landed my dream piece of knitwear, a 1970's Ballantyne cashmere turtleneck. The chances of me landing this were remote because they didn't ship to Australia and by the time wrote to them and got a response these highly sort after items are nearly always sold before l have a chance to buy them. This time l got lucky and made a dream come true! Said to be in amazing condition. 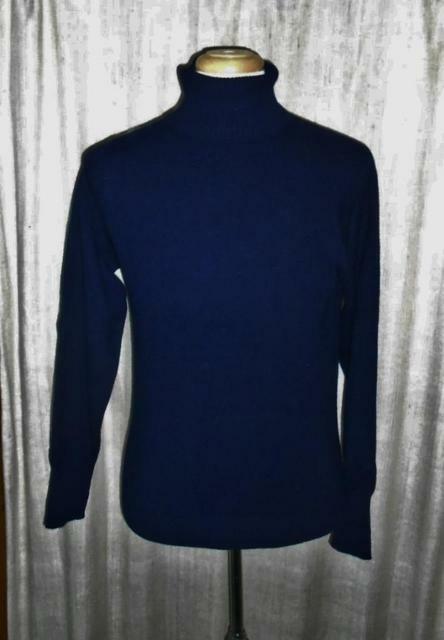 1970's navy cashmere turtleneck by Ballantyne of Scotland. I will also say my Gladstone on Hawick turtleneck l purchased is a beauty. Such quality and so solid. Remember, l only paid $25 for that. Yeah, I can see that fine weave and drape that is unique to cashmere. I bet you they are all made in Scotland. I like this guy. "Because Warren Oates has a different cashmere sweater for every occasion"
"He wears cashmere sweaters and keeps a pint of liquor in his boot"
"The driver's sweater is a light, very expensive yellow cashmere"
" a revolving wardrobe of V-neck cashmere sweaters"
I didn't even bother looking up that the sweaters were cashmere. As you point out the weave and drape are unmistakably cashmere. Given that the movie is made in the very early 70s and the obvious high quality and the brilliant colors of the cashmere it is also unmistakably made in Scotland. Do you know who does the knitwear for E.Marinella? They seem to favor knitwear along with ties in their old store. I image the quality should be good. I want to get a couple of pieces for next winter and I'll visit Napoli and London in September. I'll probably end up in the A&S haberdashery to get something from Inis Meáin. But things have become continuously worse for cashmere and woollen jumper wearers since then: warmer, hotter public and private transport systems and the curse of central heating. 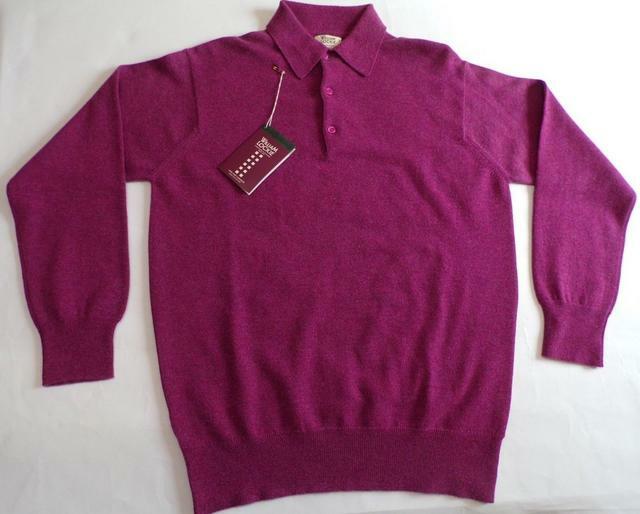 I am surprised under such conditions the cotton jumper is still relegated to a bit of a niche market: Brooks Brothers. Which I might add, my missus picked-up two decent v-neck ones for a mere Euros 34 in BB Rome last week. I'll probably end up in the A&S haberdashery to get something from Inis Meáin. Inis is okay, but not impressed with longevity, so I actually want to try something else for winter. Both END and Frans Boone have a pretty good Inis selection. I'd rather purchase chunky knits from Lockie or Laing but they are really difficult to find (the chunky models) in my size. I tried to warn them suggesting Center Parcs in Belgium or The Netherlands instead. They stayed in a very good hotel in central Rome, but still the queues were too much and then there was the lady boy hookers outside the nearby water park that put them off everyday as they were driving to the outlet village. I could have bought a stunning stylish chunky Lockie 6 ply shawl neck not too long ago, but passed because l wanted a more adventurous 12 ply. Yeah, Inis is only mid end, and only o.k. They can make beautiful garments, but the quality is not there like it could be. Why? Because the wool pills quite a bit and the construction feels weak like the arms could easily pull off, and cheap looking plastic buttons. The arms are built for wrestlers, no kidding. Both of my scottish Hermes cashmere jumpers are like this. Will be shrinking the arms over numerous washes and leaving out in the sun. These methods can work without damaging the cashmere. Phenomenal! No pilling on any of the jumpers worn under a tweed coat except one. Decent, but not true highend. Does pill abit, more delicate and not as well constructed IMO as the top vintage scottish stuff. It's good midend quality. The myth - Scottish is better than Italian cashmere jumpers. O.k, the best of Scotland will always win, well at least vintage highend Scottish cashmere does, BUT the ltalian cashmere jumpers are great quality and nothing to be sneezed at. My Loro Piana baby cashmere jumper is both solid and well constructed and doesn't pill at all and is true highend knitwear that is certainly better than various more recent offerings of made-in-Scotland knitwear from Brooks Bros and Johnstons of Elgin. The LP baby cashmere is far from flimsy and stands tall in my collection among the great cashmere makers. Not overly soft, just solid. Sometimes l confuse it with my vintage Pringle turtleneck, quality is similar, both are solid. Once again, great quality. More flimsy and soft and lower knit density, but doesn't pill at all. A wonderful garment. The most stunning cashmere of all. One thicker very soft oily feeling cashmere garment pills while the other thinner dry cashmere garment doesn't pill at all. Doesn't feel as well constructed as the Scottish. Great cashmere that doesn't pill. Seems to have guard hairs in it, so cashmere sorting process may not be as strict IMO. Modern day offerings are unremarkable. Doesn't seem to pill so far. Flimsy and thin. 1). Thinner cashmere garments are more prone to pilling. NOT TRUE!!! I have high density cashmere knits that pill and thinner lower density knits that don't pill. I have 1 ply knits that don't pill and have 2 ply knits that do pill. 2). Italian cashmere is overly soft and low density. Not always. vintage Ballantyne cashmere is the undisputed winner!!! Vintage Lyle & Scott and Pringle are good, but Ballantyne is the best of all without any doubts in my mind. It's solid hard cashmere that seems to have little processing, and it seems to be a garment made to stand the test of time. All the top Scottish garments stand the test of time, but the Ballantyne seems to be the most robust and sturdy of all. Some Ballantynes are better than others. Thanks for the in short report The Shooman . I've been almost daily looking on ebay for vintage Ballantyne, and bought a beige V-neck few months ago, but the offer of old Ballantynes in smaller sizes is very scarce. (38"-40"). Yeah, l check everyday for Ballantyne also. Size 38 - 40 is extremely difficult to find. 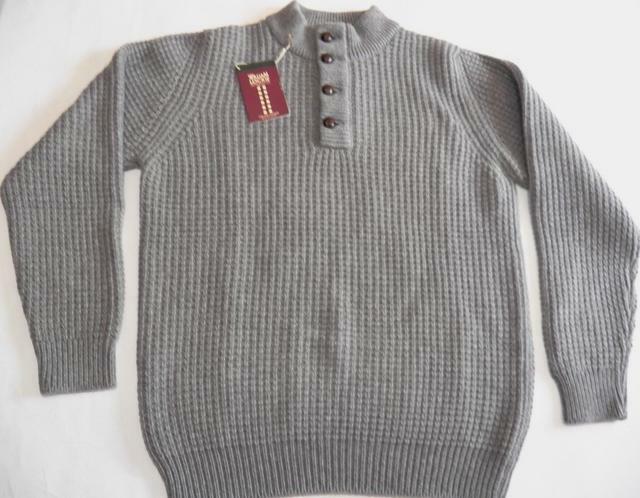 Btw, the Hermes made-in-Scotland vintage cashmere jumpers are absolutely superb also, and appear to be made by Ballantyne, but they are made at a slightly higher standard because the armpits are re-enforced with grosgrain inside the jumper. No other jumpers l know of have this special feature. As for the cashmere quality, it is as good as it gets imo, pure perfection! One Hermes is the typical dry cashmere that is classic Ballantyne where-as the other is a thick oily feeling sumptuous cashmere that is more rarely used in the Ballantynes. Hermes use special colours, special construction that is unique (grosgrain armpits inside), but it has weird fit such as wide arms and one Hermes having quite a high V neck. None-the-less it will be interesting to see what the Hermes experience delivers over the coarse of a lifetime. - Will the name live up to it's hype? - Will Hermes outshine Ballantyne? I look forward to finding out the answers two those two questions. Hermes made-in-Scotland scarves v's vintage 1970's Ballantyne cashmere scarves. I have two from each maker and will say that both are very high quality, but the Hermes are the best because the cashmere is really thick and luxuriously self-indulgent. The weave is identicle to Johnstons of Elgin scarves, however the thickness of the JoE is much thinner and more flimsy when compared to the Hermes. I wonder how Hermes compare to Begg & Co, and l wonder just now if Begg & Co could even make for Hermes. I nearly bought a Begg & Co a while back, and one day l may even get one to compare to the Hermes. Paggy says Begg is the best....maybe it is, and maybe they make for Hermes too...would be good to find out. I would be willing to bet it is a possibility because JoE now is said to source cashmere from China, and in my experience this Chinese cashmere pills somewhat. I doubt Hermes would want to use a maker who compromises. Then again, given some of the hideous glued sole shoos they make, and given all the girls at the Purse Forum that complain about Hermes cashmere falling apart and pilling after 1 hour, who really knows. Then again, cashmere is supposed to vary from season to season with some lowly names apparently churning out good stuff that doesn't pill and some great names churning out stuff that pills alot. It seems like good cashmere is a gamble, you either win or you lose. It's hard to really know. One thing l do know is that thick Irish arans are not as warm as thick scottish cashmere jumpers. I have a cashmere turtleneck jumper that is probably 8 ply and it is thick and luxurious, so now l am going to add this notable addition to my collection. It is a 6 ply William Lockie. It is not my first choice in colour, but it is a quality 6 ply jumper. On really cold days when l am outside all day l may even wear it over my 8 ply turtleneck. I like to be really prepared with extremely warm clothes, so this is a welcome addition to my cashmere family. My cashmere collection has been an absolute delight this winter. I have been loving the winter and have been rugged up in cashmere everyday, and most days l have worn a turtleneck. I'll be sad to see the winter end. Pity it couldn't be freezing cold and gloomy everyday. Would be nice to live down the botton of New Zealand where the freezing wind blows a gale everyday (opposite Antarctica). Nothing much better than a strong cold wind. Queen Victoria was the same....she'd open the windows at Balmoral castle and all her guests would be shivering, but she loved the freezing cold winds and gloomy winters. 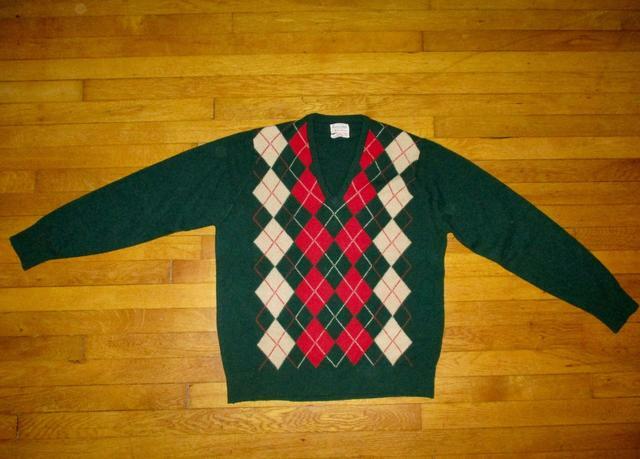 This thread has inspired me to buy a 60s-era vintage Ballantyne green V-neck sweater. Looking forward to wearing it this winter. got a pic of it and the label? The extremely rare Ballantyne 6 ply cashmere shawl neck cardigan. Not mine, it used to be owned by RJman and bought for 1,300 pounds back in 2007/08. it was not owned by RJman afterall. He chickened out the purchase because it was too costly. If l had my way i'd own 12 ply Ballantyne vicuna shawl neck cardigans for the ultimate treasure in knitwear. Of course they don't exist, and of course they'd probably be over $100,000, but i'd love to own one just to have the experience. I notice that 6 and 12 plys are very hard to find by any maker. I blame central heating for the limited market. Thick cashmere jumpers interest me greatly! I nearly bought a Begg & Co a while back, and one day l may even get one to compare to the Hermes. Paggy says Begg is the best....maybe it is, and maybe they make for Hermes too...would be good to find out. . Apparently Begg & Co do make cashmere scarves for Hermes. All l can say is that Hermes have amazing cashmere scarves, thick and plush, the best l own by far. Better than Pringle, Ballantyne Johnstons of Elgin scarves etc. It would be possible today to reproduce the quality of the old Ballantyne's? I guess it's a matter of finding the right yarn and the right machines, as designs are nothing special. If I had the funds, I'd set up a company dedicated to reproduce them. Like The real mcoys and other heritage brands do with denim and militaria. 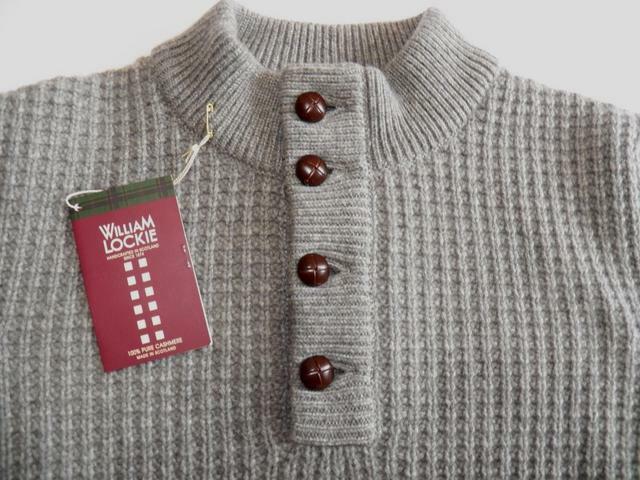 William Lockie 6 ply 8 gauge cashmere. Over 2 pounds of cashmere, and nice and heavy! I wanted something extra warm. Got it for a decent price. This is actually thicker than my other Lockie which is a 5 gauge. It might be impossible. Why? If the old Ballantyne looms were responsible for the special dense knits, then the first thing someone would need to do is reproduce the old looms that were hand made close to over 100 years ago. Who would have the knowhow and skill to do it??? As for the knowhow of the Ballantyne workforce, Berk claims to have employed many of the old workers. And of course we would want the raw largely unprocessed finish Ballantyne was famous for. Besides...who wants to pay 2,000 pounds for a Ballantyne 6 ply? Me think that most cashed up folks would rather pay for made-in-Italy than made-in-Scotland because it sounds better to the average joe. 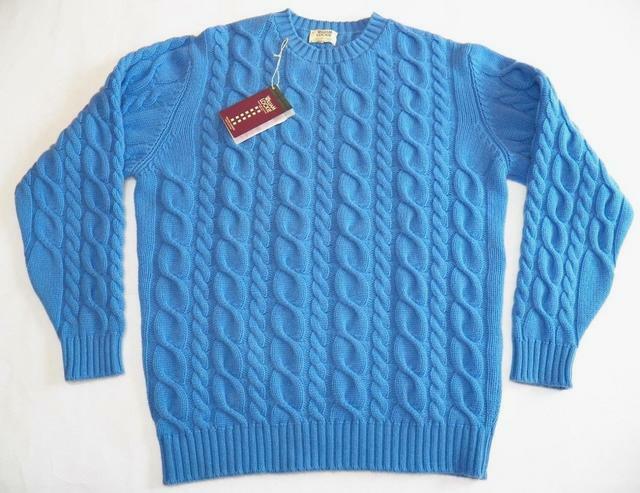 Is there a market for such luxury for made-in-Scotland knitwear without the big names of the ltalian companies (made-in-scotland Hermes brand the exception). Can the Scottish make the variety that the ltalians do. It all counts. So many thick ltalian knit designs, but few Scottish ones. It would be nice to have a couple of Ballantyne 12 ply shawl cardigans in cashmere, but imagine the hefty price. If RJman's was 1,300 pound in 2007, I would imagine you'd be at least looking at 4,000 pounds these days for 12 ply cashmere. People would need to be educated about the products, and the companies need to market themselves. People have the money, but the companies need to give them a reason to spend it. When l look at Scottish cashmere l see so many empty spaces they leave in the market place. They supply very little variety and have little presence....they are almost non existent! They just don't come across as business people, but that's why l love `em....they come across as people who put their products first and business second where-as those ltalians are mainly about the money and marketing first and product next IMO, and they'll pump those ltalian numbers out by the thousands. Remember, the Scottish were doing laborious handmade intarsias while the ltalians were doing machine made intarsias from the 1950's. And also remember, the Scottish treated cashmere was also more expensive than the ltalian treated cashmere according to old industry sources l quoted here, and this COULD also mean the Scottish treatments were more labor intensive than the ltalians also. The Scottish seemed to do cashmere sweaters the long and hard way with profit becoming a secondary thought. I couldn't resist this. Such a beauty! 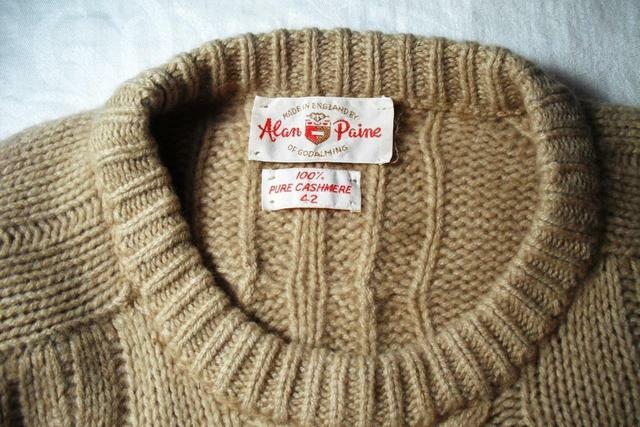 vintage Alan Paine argyle cashmere made-in-England. They are now made in China. 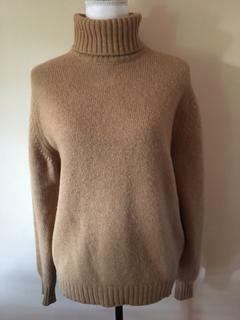 There was also this gem, a vintage Alan Paine turtleneck made from camel hair going for hardly anything. Slightly too wide for me otherwise l would have snapped it up instantly. How amazing is this! Where does Alan Paine fit in the cashmere hierarchy? vintage Alan Paine is supposed to be near the very top. As usual the quality will vary due to the nature of cashmere. Some say it is almost as good as the top Scottish cashmere, while others like Vox have spoken about their purchase of 6 ply cashmere cableknits in the 1980's that have never pilled and look as knew as when they bought them decades before, and he also basically said that the modern day knits don't seem to compare to his old Paines. I got my Lockie 6 ply this morning. The gauge and thickness doesn't compare to my old Scottish Lanimer. My Lanimer is twice as thick and dense. Looking forward to my other Lockie, it will be much more dense and heavy. I really think 12 ply cashmere jumpers are the go for me. Arans (virgin wool) and 6 ply (cashmere) are not warm enough for winter despite me also wearing thermal wool wear and sometimes another cashmere layer underneath. I do feel the cold. That is a nice piece Shooey. @Truth I thought you might have liked it. @Truth I thought you'd like it. I know you like manly stuff like thick rollnecks, casual manly boots and tractors etc, so when you endorse this it tells me l am on the right track. Actually, when l bought it l thought to myself, Truth is going to like this because it is quite manly. Really pumped about getting it. The Lockie 6 ply l got is good midend quality imo, but it is not up to the highend stuff. Why? 1). the knit density is only 5 gauge. It is not as dense as l would like it. 2). the construction is typical of many mid ends like Inis Meain and Brunello Cucinelli....it feels weak like the arms are not secured strong enough. Maybe this is my imagination and it is just the stretch that makes me feel this way, but what l do know is that the old Scottish cashmere never had this issue, the old cashmere never stretched and the arms felt solidly attached. 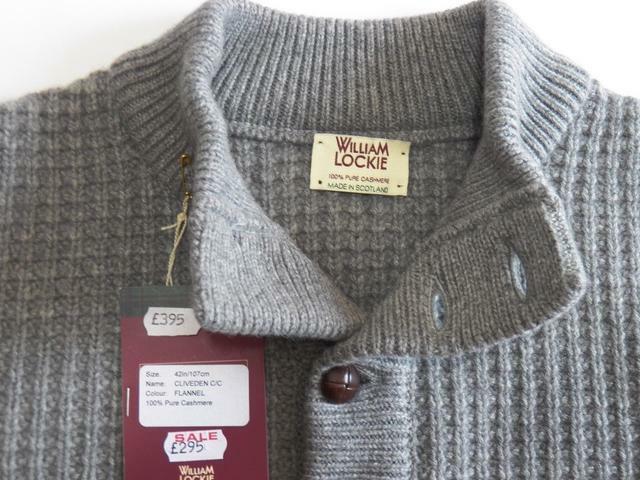 Lockie is a typical midend price, and to me corners are being cut with the 6 ply in using thinner knits and lower gauge knits and less handwork in the construction of the garment in order to keep the price low. Same goes with my Brunello Cucinelli cableknit...lower gauge, plastic buttons, stretchy and arms feel like they are not attached as securely (less handwork?). To me it screams that corners are being cut somewhere. It's not real highend like the old Scottish cashmere jumpers. That being said, the cashmere can still be good, but it is the making of the garments that really show a decline in quality. Like an industry lady said, there is not true highend luxury cashmere pieces anymore. Even the more recent Hermes made-in-Scotland pieces, they are not going to be Ballantyne or Pringle or made by the old luxury cashmere houses anymore. In my limited knowledge,the extra work that goes into Scottish jumpers is not able to be sustained because the marketing and prices were not enough to sustain that highend market. The Scottish has to cut corners to survive IMO. Johnstons of Elgin is the same, it's only scrapes in the middle tier of midend while Brunello Cucinelli is in the highend tier of midend. Hahaha, thanks Shooey. Did you ultimately order the O'Maille Aran rollneck? Yes, i've ordered a couple, and plan to order more in the future. They are works of art. You originally inspired me to look into these because l wanted something fat and manly like you were buying, so l ordered this to have the ultimate fat manly jumper. I got this, except mine had a turtleneck. It is a stunner! Call us on 020 3490 2729 for info. from 11am. By any chance, does anyone (looking at you shooman ) have any good pictures of a vintage turtleneck with saddle shoulders? Looking to see how they sewed the seams, particular as it crosses the shoulders and moves towards the neck. I'm going to find out next winter. This arrived today. Got it for a song. B ballmouse I am not the man to ask about this. I picked up this beautiful William Lockie cashmere polo. This is perfect for Spring evenings or casual day wear. I received my Lockie 8 gauge 6 ply (see post #422 above) and it is a beauty. Nice and heavy, almost twice the weight of my other Lockie 6 ply. My other Lockie (the medium blue at post #414) has got a little bit of pilling already after three or four wears. It still keeps me warm when it gets a touch chilly, but l really need to get the 12 ply cashmere jumpers as staples for early morning wear in Winter. 6 ply isn't enough for me during winter, so l need the fat ones. the William Lockie at the lower prices ain't like the old top end stuff. The Lockie stuff l bought is more for casual muck around stuff or for a slightly chilly night at home. I scored a real winner today, and will be perhaps one of my most prized jumpers. Finding high quality heavyweight cashmere cableknits is almost impossible. 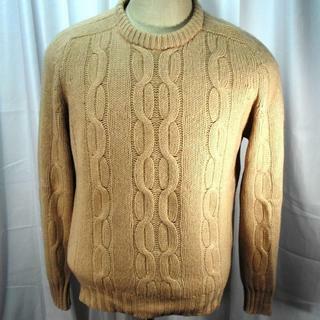 vintage Alan Paine heavy weight cashmere cableknit - made-in-England. Even my William Lockie heavyweight is now a prized item in my collection, but this is going to be the golden standard for heavy weights. See....Vox has meaty Alan Paine cashmere cableknits from the 80's that look brand new, and now l have a vintage heavy weight which also looks new. Where can a man find such quality these days. Sure a $3,000 Kiton 8ply may be approaching the quality, but my experience is that even the highest end ltalians can be unreliable in quality (can pill slightly and be stretchy and not feel as robust) and certainly not as good as the old U.K cashmere jumpers. William Lockie is pretty much spot-on, but in these parts I only sport for about 2 months of the year when it's cold enough. Rest of the time, I'll go with Brooks Brothers cotton jumpers. Not the best fit mind you, but there really is no alternative if you want a cotton jumper. But what do you do when it's not cold enough for a proper wool jumper? William Lockie is pretty much spot-on, but in these parts I only sport for about 2 months of the year when it's cold enough. can l ask, what part of the world do you come from? Rest of the time, I'll go with Brooks Brothers cotton jumpers. Not the best fit mind you, but there really is no alternative if you want a cotton jumper. how horrible. One thing l really enjoy is wearing really warm knitwear 7 months of the year and winter pants. 5). you will never get anything like the vintage U.K cashmere jumpers anymore. The golden era of cashmere luxury. Would l recommend cashmere these days? Hard to say, but alpaca seems pretty good. Wears well without pilling apparently, but not as warm. A turtleneck l saw this morning online. Terrible!